You think you're a good multitasker? You've got 20 Firefox tabs open (or IE) and you're watching a YouTube video while reading email. Bet you're proud of yourself huh? Well, have a cool piece of software for you! It's called TeVeStream OctoMediaPlayer, a new multiple view video player for Windows that allows the viewing of eight videos simultaneously. Of course, simultaneously watching & listening to 8 videos is impossible for the human brain to decipher. Star Trek's Data could do it though. In one episode he even had several pieces of classical music playing in his quarters. When the time traveler & gadget stealer Berlinghoff Rasmussen (played by Matt Frewer) arrives in Data's quarters, he asks Data to reduce the number of songs playing since it was giving him a headache. 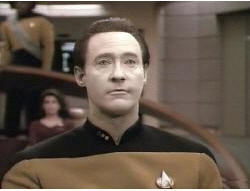 According to Memory Alpha, two of the pieces of classical music simultaneously listened to by Data in this episode were heard again in later Trek episodes. The Third Brandenburg Concerto was later played by Captain Picard on his Ressikan flute and La donna è mobile was regularly sung by The Doctor. In any event, OctoMediaPlayer runs on Windows Vista, XP, and 2003 and it priced at $29 USD, and an evaluation download is also available. Physicists build first single-photon router - Positronic brain next? Cell Phone Time Traveller Caught on 1928 Film? \n Of course, simultaneously watching & listening to 8 videos is impossible for the human brain to decipher. Star Trek's Data could do it though. In one episode he even had several pieces of classical music playing in his quarters. When the time traveler & gadget stealer Berlinghoff Rasmussen (played by Matt Frewer) arrives in Data's quarters, he asks Data to reduce the number of songs playing since it was giving him a headache. \nAccording to Memory Alpha, two of the pieces of classical music simultaneously listened to by Data in this episode were heard again in later Trek episodes. The Third Brandenburg Concerto was later played by Captain Picard on his Ressikan flute and La donna è mobile was regularly sung by The Doctor. \nIn any event, OctoMediaPlayer runs on Windows Vista, XP, and 2003 and it priced at \$29 USD, and an evaluation download is also available.